One of the more pleasant surprises of 2016 was the Modor NF-1, a knobby digital synthesizer with an eye-catching layout. Along with a selection of oscillator types, it featured a formant filter which offered morphing between three different vowels. Via parallel band-pass filters (focused on specific frequencies), it delivered convincing vocal tones; it’s therefore yet another pleasant surprise to find this technology rehoused for Eurorack. Size: 16HP. Current: +12V = 140mA, -12V = 20mA.The module offers stereo operation and dual CV inputs, although sadly there’s but a single shared CV amount — and no input level controls. Nevertheless, you’re able to supply different modulation sources for each CV input to produce some very cool stereo effects. By turning the large white Formant knob, you can manually sweep between three vowels, with a trio of LEDs acting as a visual reference. In the knob’s leftmost position, the first LED lights up and if you wish you can select a new vowel for that position. Pressing the Vowel button steps through the 10 available presets, which are: A, E, I, O, U, OE, EI, EU, AO and UI. This aspect of the user interface felt a little clunky, at least if you wished to define a specific morph group; you’re forced to count button presses or rely on your ears. And, depending on the source audio, it might not be easy to differentiate between (for example) a ‘U’ and a ‘EU’. Having chosen the first vowel, you turn the knob until the second LED lights, dial up a new vowel and so on. If you like what you’ve put together and want these values loaded on power up, Shift and Vowel will achieve that for you. Morphing between the preset vowels can generate changing, voice-like effects, using harmonically rich input waveforms such as sawtooth or even white noise. In common with Modor’s NF-1 synth, you can also break away from the preset vowels and have a go at creating your own. The knobs labelled 1 to 4 are used to sweep the frequency bands and if the shift key is drafted in, it attenuates the first three frequencies. The vowel’s overall volume is set by combining shift with the 4th knob. 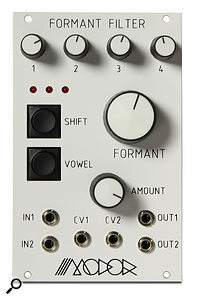 It turns out that it is far from easy to stumble across new vowels that rival the presets. Indeed, you’ll quickly notice that many of the knob positions generate nasty, howly noises instead. I’d say that these are not controls you’d be likely to tweak during performance. Assuming you eventually hit on something interesting, I’m afraid there’s no way to store your hard-won creations, other than by the default power-up save process I mentioned earlier. I realise that adding a display or extra indicators would have raised the price of the module. Similarly, CV inputs for the edit controls might have initially seemed a good idea, but given the unpredictable (and sometimes downright challenging) nature of the results, vowel creation could be more of a quirky side-function than a major selling point. First and foremost, this module makes stereo vocal filtering both simple and accessible. Although my reservation about the single CV attenuator remains, I obtained some pleasing results from this spartan interface. Some of my favourite sounds came from processing a regular synth waveform through one input and noise through the other. By modulating these with different sources, perhaps a pair of not-quite synchronised LFOs, I hit upon many rich, speech-like textures, especially when I drafted in a couple of external VCAs to provide modulation of the level of each output. If you’re interested in vocal tones and don’t want to get bogged down in complication, this filter is worth checking out.